This Seamaster Diver chronograph watch boasts a striking blue dial and unidirectional bezel, upon a sleek stainless steel case and bracelet. Featuring date display window at the 3-o-clock mark, the distinctive dial is covered by domed scratch-resistant sapphire crystal. Powered by co-axial chronometer, this watch is finished with an impressive 300 metres water resistancy. 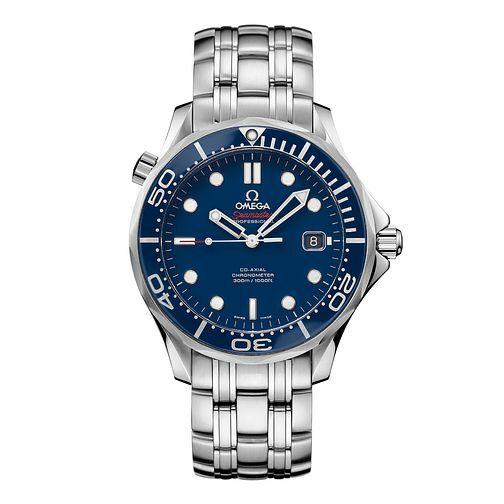 Omega Seamaster Diver 300M men's blue dial bracelet watch is rated 4.6 out of 5 by 9. Rated 5 out of 5 by Anonymous from Amazing watch Absolute Fantastic quality and the blue dial changes colour in different lighting so very classy! Rated 5 out of 5 by Anonymous from Beautiful timepiece Worth every penny , and presented so well , really pleased with it.